This transit has a lot of unique aspects, as Saturn will not be completing its stay in one go; it would be travelling in a retrograde motion between 6th June, 2017 and 25th August, 2017. Then, it will turn direct and finish its stay in Scorpio. Then, on the 26th October, 2017, it will finally enter Sagittarius and stay there for its normal duration of 2.5 years or 30 months. Thereafter, it will enter Capricorn on 24th January, 2020. Saturn inspires you to imbibe the qualities of the sign it inhabits. For example, when Saturn is transiting in Sagittarius, you would crave for knowledge, wisdom, and the deeper philosophical meaning of life. But being a slow-moving planet, Saturn slows things down considerably, and this can be very frustrating when you want instant results. Saturn takes its own sweet time, which is a good thing, as it takes you to a healthy, balanced place, provided you do the things you are involved in – thoroughly. Saturn also inspires a desire to control, and you could end up trying to control other peoples' lives through your interactions with them. Since nobody likes to be controlled, you can land up on the wrong side in their books, and relationships could suffer. Find out how Saturn affects you with Saturn Transit Report. The negative expressions of Sagittarius, such as excessiveness, brashness and irresponsibility will be manifested during Saturn's retrogression. In some way or the other, you will be made to realize that you have to pay a big price for such negative behavior, not just in terms of money but also in terms of time, energy and happiness. Saturn can be a hard task-master, and demands definitions, structures, and commitments, which are things that can make you feel claustrophobic, trapped and limited. However, Saturn in Sagittarius can teach you that when you abide by certain rules and regulations, even to the point of denying yourself things that you may deeply desire, it can lead to a great sense of liberation. Saturn transit in Sagittarius is clearly the time to make your choices, take firm decisions, and let go of things that do not work for you. 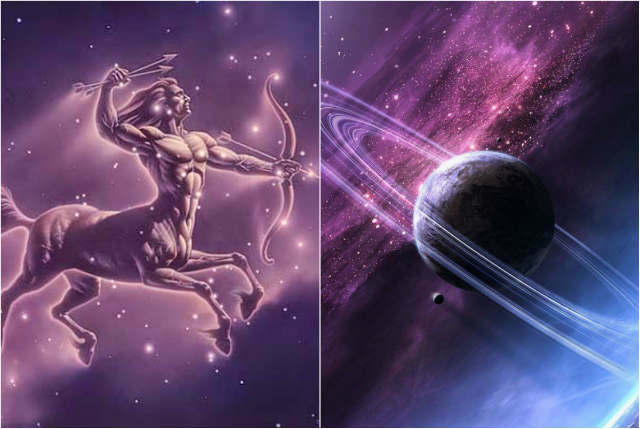 Sagittarius invokes you to increase your level of understanding and awareness, but with Saturn transiting in Sagittarius, you need to do so in a realistic manner. Sagittarius can make you somewhat messy as you chase new knowledge and experience, but Saturn will want you to tidy up your act. Sagittarius has its eyes riveted on the big picture and thereby you will gain confidence, but Saturn will goad you to also fill in some details. Positive thinking is a great thing, but not flying castles in the air, as it can lead to disappointments and frustrations, which is another lesson that Saturn teaches you: stay down to earth. The Moon Signs Scorpio, Sagittarius and Capricorn will be undergoing the respective phases of Sade Sati. Get Personalised Sade Sati Report. The Saturn Transit in Sagittarius will aim to practically apply your personal philosophies. You may be crystallizing your belief systems, but you should avoid stubborn thinking. There will be times when you feel that your freedom is being curtailed, but you will soon realize that freedom is not about running away from responsibility, but that you will experience true freedom only after you have tended to your responsibilities. Saturn in Sagittarius will test your values. If you have become prone to preaching a lot, you will be made to realize that you need to practice what you preach. The Saturn-Ketu conjunction suggests that an unfortunate series of events is likely to take place in the world, which will lead to great loss of life and property. It also indicates obstructions, fatal accidents, epidemics, floods, earthquakes and storms. When Saturn joins Ketu, its indications of estrangement, natural disasters, or major violent events will be manifested in various parts of the world. There could be heavy casualties. Also, there is a strong possibility of some huge financial disaster, fatal epidemics or biological warfare. Whatever the event may be, the Shani-Ketu conjunction, also known as the Shapit Yoga, is malefic and long-lasting enough to indicate a major strain on humanity during 2019. The Jupiter-Saturn-Ketu conjunction creates two negative combinations individually – the Shani-Ketu Shapit Yoga and the Guru-Ketu Chandal Yoga. This factor indicates an imbalance in natural resources, general and political instability, and communal disharmony, but Jupiter's influence can mitigate the malefic effects of these events to some extent. Also, Jupiter has turned retrograde on 6th February, 2017. Ganesha suggests you must also find out how Jupiter affects you. Get Personalised Jupiter Transit Report. In India's Foundation Chart, Taurus is the rising Sign and the Saturn-Ketu-Jupiter combine will take place in the 8th House. The 8th House denotes calamities, unrest, sudden events, mystery and disasters. Thus, there may be some serious issues and the electoral process may also remain a highly volatile affair. Things may get trickier for the incumbent government during this transit. As Saturn happens to be the Lord of the 9th House and 10th House in India's Foundation Chart, there may be some major changes in India's international policies. Moreover, the equations between the Government and the opposition parties may become turbulent. Ganesha feels that there will be a lot of changes taking place in the United States of America, as Saturn will be transiting through the 5th House of its Foundation Chart and will be aspecting the stellium of planets posited in the 11th House. Moreover, during the year 2019, Rahu will be transiting over this cluster and the Saturn-Ketu-Jupiter union will be taking place in the 5th House. Drastic structural changes are foreseen during this year and the relations of the superpower with other countries may get impacted. The decisions being taken and the policies that are implemented in this year will have a huge impact on various other countries. Unrest and turbulence as well as civil disturbance during this period cannot be ruled out as well. It is interesting to note that Leo is the rising Sign in the Charts of both the USA and Trump. Thus, there is a lot more coming from President Trump, says Ganesha.